Chicago Tribune newspaper editor and owner Joseph Medill's handwritten letter to Abraham Lincoln the day of Lincoln's assassination, April 14, 1865. 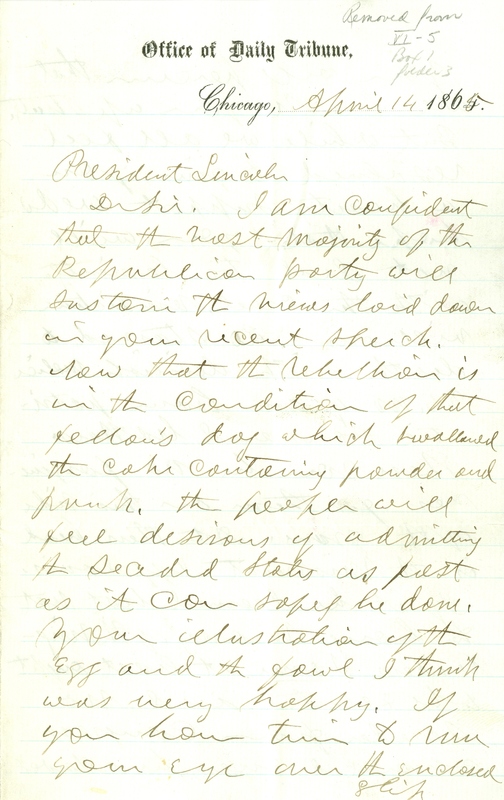 With Union victory in sight, Medill advises Lincoln to "not deal too leniently" with the Confederate leaders. Lincoln would never receive this letter. to set foot in the halls of congress again. No West Pointer who resigned federal service to take up arms against his country should ever be allowed to hold a commission in our army again. It may not be advisable to confiscate the property of rebels or to hang many of them, but surely the leaders should all be disenfranchised and forbidden to hold office. I think this much of the loyal people will strenuously insist upon. The ignorant masses we can forgive. They have been well punished for their folly already, but the guilty leaders should be taught that there is just punishment often death. We hope to have you here at the opening of our Great Fair – accompanied by Mrs. Lincoln. Our people count on it. You have staid (sic) in Washington long enough without a furlough and should now take one. The weather will be delightful, and everything will conspire to make your visit pleasant and agreeable. We will agree not to shake you to death but will not pledge to refrain from pretty loud cheering.